Frizz. It’s a personal year-round affliction that, for visual reference, puts my hair in the company of Mia Thermopolis, Hermione, and The Starchild. For years, I attributed my dry, coarse, electrically charged strands to genetics, so I was surprised when AQUIS Prime redirected my attention to a basic yet highly influential determinant: hair washing. Before I was tasked with testing the new system, my routine was simple: shampoo, condition, towel dry. Job done. Well, as it turns out, not quite. 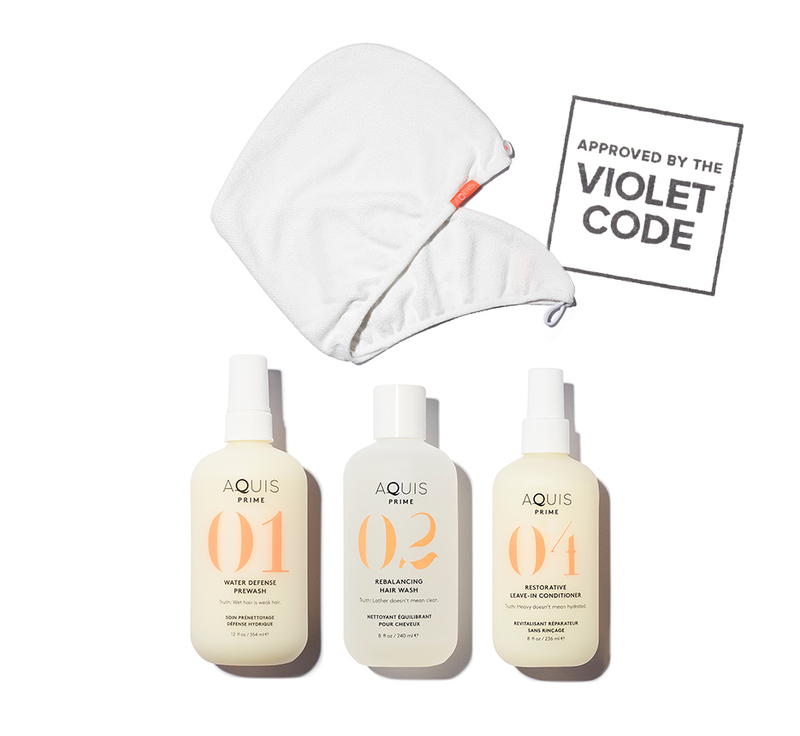 AQUIS, aka the geniuses behind Rapid Dry Hair Turban (more on that here), is rewriting the shower rules with conscious cleansing. Encompassing four easy steps, the Prime System includes a Water Defense Pre-Wash Spray, Rebalancing Hair Wash, Rapid Dry Hair Turban, and Restorative Leave-In Conditioner. Shaking your head at the thought of adding a prewash step and a dedicated towel? Initially, so was I, but it’s less labor-intensive than it sounds and it speeds up the whole process. And, most important, it leaves hair looking and feeling healthier, sleeker, and shinier than before. You know how soft and weak your nails look after a bath? Hair strands, which are made of keratin, experience similar hygral fatigue when overexposed to water. Too much water causes hair to stretch, swell, and weaken, making it prone to breakage. I panicked when this was explained to me (my showers run really long). But I was bathed in relief when I learned AQUIS Prime prevents strands from getting waterlogged with the help of amino acids and balances hair’s pH to mitigate water absorption, which in turn reduces tangles and frizz. The first step is to spritz the prewash all over your dry hair. My vented brush helped ensure the wash was evenly distributed. The brushing, coupled with the formula’s delicate, calming scent, immediately made the routine feel more indulgent. Jumping in the shower minutes later, I was surprised at how incredibly sleek my hair became when it touched water. Next came the hair wash, a rinse, and no conditioner—at least not yet. It felt odd to skip this step, but the Aquitex turban quickly distracted me. The last two steps really sealed the deal. Made from proprietary wicking fabric called Aquitex, the turban feels ultra-soft and wraps gently around wet strands. A button tab keeps the wrap comfortably secure and—in contrast to standard bath towels—never pulled on my hair. So did the turban keep its promise and cut my drying time by 50 percent? You bet. I was stunned by how quickly my tresses went from sopping wet to slightly damp. Finally, I sprayed on the leave-in conditioner. I’m usually not a fan because many products feel sticky, smell weird, and don’t do enough to detangle. Again, AQUIS won me over with its light yet effective detangler. I have fully converted to the Prime System, and have yet to even pick up a blow-dryer thanks to consistently smooth, shiny results—think post-makeover Mia Thermopolis.